Rob Rojas didn’t make the 500-plus-mile trip from San Clemente to Donner Lake to place second. The 39-year-old O’Neill team rider easily captured victory in the opening O’Neill Tahoe SUP Race Series of the season on Donner Lake this past Saturday, establishing a new event record with a time of 45 minutes, 52 seconds. Jay Wild of Truckee, winner of last year’s Donner Lake race, finished runner-up in a time of 47:07, while Benjamin Sarrazin of Petaluma finished hot on his heels in 47:11. Rojas’ impressive win places him in an early lead for the Tahoe SUP Race Series overall title, and in good position to secure to the top spot in the overall $20,000 prize purse. Unlike the chilly conditions the past two years — it snowed on participants the year before last — the 135 paddlers and their supporters were treated to a sunny, 65-degree day with calm winds for the 5-mile race, which started and ended at West End Beach. Sixteen-year-old Fiona Wylde of Hood River, Ore., took advantage of the favorable conditions, as the O’Neill team rider raced to a first-place finish among women, 15th overall, in a time of 52:37. Anik Wild of Truckee finished second among women in 53:55, and Jen Fuller of Sausalito was third in 53:57. Jeramie Vaine from Nevada City placed fourth overall in 48:19 and Seth Springer of Malibu rounded out the top five in 48:21. Among other top local finishers, Ronnie Ayres of Truckee was sixth overall in 48:23, Rand Carter of Tahoe Vista was eighth in 50:04, Evan Derdowski of Zephy Cove was 10th in 51:19, Michael Valenzuela of Truckee was 11th in 51:59, and Julianne Bracket of South Lake Tahoe was the fourth woman and 29th overall in 54:54. The race series continues with the Jam from the Dam on Lake Tahoe on July 13. 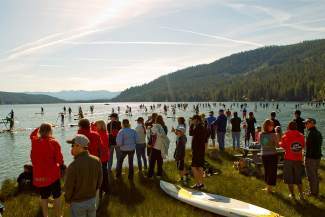 The point-to-point race starts at Commons Beach in Tahoe City and finishes 6 miles later at the Waterman’s Landing in Carnelian Bay. The Tahoe Fall Classic, a 22-mile transit of Lake Tahoe, will conclude the three-race series on Sept. 15.